As agreed by China and the United Kingdom, the 9th China-UK Economic and Financial Dialogue will be held in Beijing from December 15 to 16. Vice Premier Ma Kai and British Chancellor of Exchequer Philip Hammond will cochair the dialogue. The China-UK Economic and Financial Dialogue is a high-level dialogue whose establishment was announced by the leaders of the two countries in 2008, with the aim to conduct dialogues on the strategic, overall and long-term major issues in the economic and financial fields between China and the UK and continuously scale the China-UK economic cooperation and global comprehensive strategic partnership for the 21st century to new heights. As agreed by the two sides, the 9th China-UK Economic and Financial Dialogue will be conducted under the theme of "Deepening Bilateral Economic and Financial Cooperation to Inject New Impetus to the Golden Era of China-UK relationship", with discussions on such topics as macroeconomic situation and policy, trade, investment and industrial strategy, financial reform and financial market development, China-UK investment and financing cooperation under the Belt and Road Initiative, etc. Q: Yesterday China Central Television (CCTV) broadcasted an exclusive interview with ROK President Moon Jae-in. He said that since China and the ROK established diplomatic ties 25 years ago, the bilateral relations have enjoyed rapid development in various areas, but the mutual trust between the two was largely impaired in recent years. Mutual trust is of great importance to the development of bilateral relations, and the top aim and focus of his visit to China this time is to resume the mutual trust between the two countries and deepen the friendship between the two peoples. What's your response to this? A: We have seen that CCTV interview. At the invitation of President Xi Jinping, President Moon Jae-in will start his state visit to China from tomorrow. China and the ROK are close neighbors and important cooperation partners. During the past 25 years since the establishment of diplomatic ties, friendly exchanges and win-win cooperation remain the main theme of China-ROK relations. The two countries have extensive converging interests in promoting respective economic and social development and achieving regional peace, stability and prosperity. The sound China-ROK relations correspond with the trend of history and the times and represent the shared aspirations of the two peoples. However, due to the reason known to us all, for some time the basis of mutual trust and bilateral cooperation between the two countries has been affected. After he assumed office, President Moon Jae-in has attached importance to ROK-China relations and the ROK government has made the solemn statement on the THAAD issue. China and the ROK have reached some consensus on dealing with the issue in the current stage. 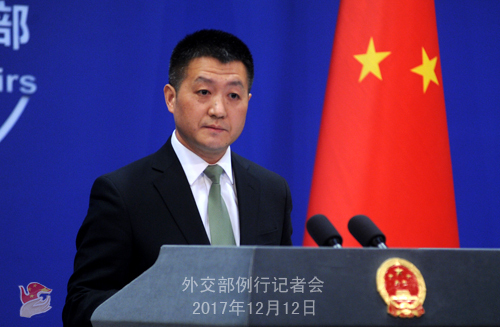 We hope that the issue can continue to be handled properly and that the two sides can bring the China-ROK relations totally back to the track of sound and steady development on the basis of respecting each other's core interests and major concerns so as to deliver greater benefits to the two peoples and promote regional peace, stability, development and prosperity. Q: According to reports, Australian lawmaker Sam Dastyari resigned after taking donations. I was wondering if you could offer any comment on this issue or in general on the allegation about the tension between the two countries on bilateral relations over China's influence in the domestic politics of Australia ? A: With regard to your first question, the resignation of an Australian lawmaker is part of Australia's internal affairs and we don't comment on the internal affairs of other countries in principle. As to your second question, I took a related question on this podium yesterday. These days certain Western countries have concerned themselves with "non-interference in other countries' internal affairs" all at once, which is a good phenomenon. If the relevant persons in these countries can firmly keep in mind the idea of "non-interference in other countries' internal affairs", this will be conducive to the sound development of international relations as I believe. Q: US President Donald Trump yesterday announced plans to send a man back to the Moon, and possible to the Mars. In one of his comments, President Trump said that space has so much to do with many other applications, including military application. Is China concerned that this renewed interest by the US government in space could mean that the US will militarize space for its own purposes? A: China is pleased to see the scientific and technological progress in the exploration and peaceful use of outer space by various countries. We believe that continuous progress in peaceful use of outer space will benefit the humankind as a whole ultimately, and China stands ready to step up cooperation with the rest of the international community in this regard. As for your second question, I need to check and verify what was said by President Trump. Yet I think you must be aware that China's position on preventing the weaponization of outer space is distinct and consistent. As early as in the disarmament talks in Geneva, China has clearly expressed its hope that various parties of the international community will reach the consensus of committing to an early conclusion of a treaty that aims for the prevention of weaponization of outer space. Q: A former basketball player Dennis Rodman was in Beijing yesterday and today. He proposed that he wants to hold a basketball match between players from the DPRK and players from Guam in Beijing. How do you respond to this idea? Would you support his idea? A: I have not heard of this information. Q: Russian President Putin yesterday announced a withdrawal of Russian soldiers from Syria. He also said that they are coming back home with victory. What is your comment? How does China comment on Russia's role in fighting terrorism in Syria as well as the current security situation in Syria? A: We have noted these statements by President Putin. In the past two years, the counter-terrorism actions inside Syria have made important headway, thanks to the enormous efforts made by Russia and other relevant parties. We maintain that the international community should continue with its coordination and cooperation on firmly combating all forms of terrorism. Meanwhile, the political process on resolving the Syrian issue shall be advanced under the auspices of the UN. Q: ROK Foreign Minister Kang Kyung-wha on December 11 stressed the need for the establishment of an effective communication channel with the DPRK to extend the common call for denuclearization from the international community. She said that the ROK government is planning to contact the DPRK and actively enhance the relationship between the DPRK and the ROK. The international community should step up diplomatic efforts to bring the DPRK back to the negotiating table while keeping pressure on it. What's your comment on this? A: We have noted the above-mentioned remarks by Foreign Minister Kang Kyung-Wha. 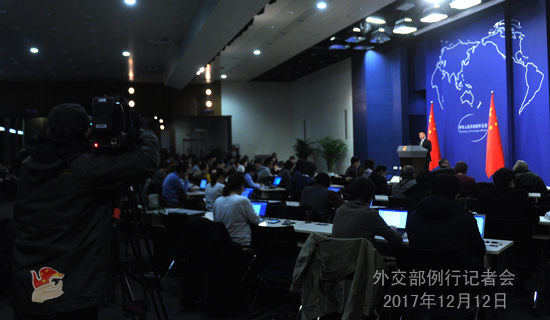 China encourages each and every effort to peacefully resolve the Korean Peninsula nuclear issue through dialogue and negotiation. In fact, China and the ROK share common interests and similar position on realizing the denuclearization of the Peninsula through dialogue and negotiation and upholding peace and stability there. We always approve of and firmly support the efforts made by both DPRK and the ROK to improve their relations through dialogue, promote reconciliation and cooperation, and play a positive role in easing the tension and upholding peace and stability of the Peninsula. We always maintain the opinion that the Korean Peninsula nuclear issue can only be peacefully resolved through dialogue and negotiation, and no war or conflict is allowed on the Peninsula. This is in the fundamental interests of regional countries and represents the widespread aspiration among the international community. We hope that all the relevant parties can work towards the shared goal to turn the current confrontation into escalation and create necessary conditions and atmosphere for resumption of dialogue and negotiation. Q: Many were injured in an explosion at a bus terminal near the Times Square of Manhattan in New York on the morning of December 11 local time. New York City Mayor Bill de Blasio said this was an attempted terror attack. What is your comment on this? A: We condemn this incident and convey our condolences to the injured. We have noted that Mayor of the New York City described this incident as an attempted terror attack. Terrorism is the common enemy of mankind. 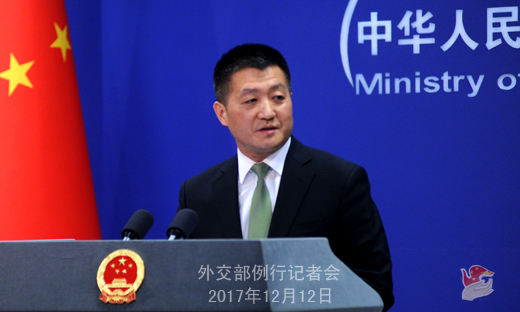 The Chinese side is opposed to all forms of terrorism and believes that the international community should step up counter-terrorism cooperation. Q: On December 10, municipal elections were held in Venezuela, during which the ruling party, United Socialist Party of Venezuela (PSUV) won the position of mayor in most cities. What is your comment on this? A: We have noted that Venezuela's municipal elections were held in a steady and orderly way. A stable Venezuela serves the fundamental interests of the Venezuelan people.